Gamma radiation measurements – on which all those low health risk statements were based – do NOT take into account radiation from alpha-emitting radionuclides such as uranium and plutonium!!! High temperatures inside the building that houses the plant’s No. 4 reactor may have caused fuel rods sitting in a pool to ignite or explode, the plant’s owner said. CNN has changed the article, but you can still see that this exact phrase has been used in the article here. GE, the company that boasts that it “brings good things to life,” was the designer of the nuclear plants that are blowing up like hot popcorn kernels at the Fukushima Daiichi generating plant north of Tokyo that was hit by the double-whammy of an 9.1 earthquake and a hugh tsunami. The company may escape tens or hundreds of billions of dollars in liability from this continuing disaster, which could still result in a catastrophic total meltdown of one or more of the reactors (as of this writing three of the reactors are reported to have suffered explosions and partial meltdowns, and all could potentially become more serious total meltdowns with a rupture of the reactor container), thanks to Japanese law, which makes the operator–in this case Tokyo Electric Power Co. (TEPCO) liable. But if it were found that it was design flaws by GE that caused the problem, presumably TEPCO or the Japanese government could pursue GE for damages. In fact, the design of these facilities–a design which, it should be noted, was also used in 23 nuclear plants operating in the US in Alabama, Georgia, Illinois, Iowa, Massachusetts, Minnesota, Nebraska, New Jersey, New York, North Carolina, Pennsylvania and Vermont–appear to have included serious flaws, from a safety perspective. The drawings of the plants in question, called Mark I systems, provide no way for venting hydrogen gas from the containment buildings, despite the fact that one of the first things that happens in the event of a cooling failure is the massive production of hydrogen gas by the exposed fuel rods in the core. This is why three of the nuclear generator buildings at Fukushima Daiichi have exploded with tremendous force blasting off the roof and walls of the structures, and damaging control equipment needed to control the reactors. One would have thought that design engineers at GE would have thought about that possibility, and provided venting systems for any hydrogen gas being vented in an emergency into the building. But no. They didn’t. As Robert Alvarez, a former nuclear energy adviser to President Bill Clinton, has written, if these waste containers, euphemistically called “ponds,” were to be damaged in an explosion and lose their cooling and radiation-shielding water, they could burst into flame from the resulting burning of the highly flammable zirconium cladding of the fuel rods, blasting perhaps three to nine times as much of these materials into the air as was released by the Chernobyl reactor disaster. (And that’s if just one reactor blows!) Each pool, Alvarez says, generally contains five to ten times as much nuclear material as the reactors themselves. Alvarez cites a 1997 Nuclear Regulatory Commission study that predicted that a waste pool fire could render a 188-square-mile area “uninhabitable” and do $59 billion worth of damage (but that was 13 years ago). Adding to that worry, Alvarez says photos of Reactor 3 seem to show white steam rising from the damaged facility, from a location where the spent fuel pond would likely be. But it gets worse. 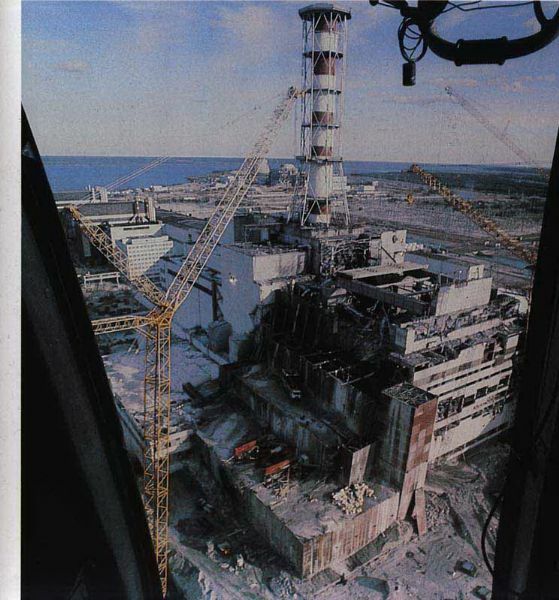 According to news reports, the Reactor 3 unit was being fueled with MOX, a controversial mixed oxides fuel rod, which includes, in addition to uranium, a significant amount of plutonium–a far more dangerous element both chemically as a toxin, and in terms of its radioactivity. You have to ask, what kind of numbskull would put the waste “pond” for spend fuel right above the reactor of a nuclear plant, thus insuring that in the event of a meltdown, not only would the core of the reactor blow up into the environment, but also all of the spent fuel from prior years? I don’t know. I heard about those waste “pools” in the past, and always assumed they were somewhere on the plant grounds away from the reactor itself, but now it turns out they are right in the line of fire of any meltdown. Boy, that’s just brilliant! It’s as if you put the oil tank for your furnace right above the furnace in your basement, so that if there was some problem with the furnace it would ignite the tank, or as if you put the gas tank of your car right above the engine, so that if you had an engine fire, it would explode the gas tank! This may explain why people in India are reportedly rethinking GE’s bid for a big piece of the country’s proposed market for $150 billion in new nuclear power plants in that country, and why it may not be so easy for GE and other nuclear plant builders to escape liability for their products in the future. Back in November, President Obama was in India pushing that country’s government to pass legislation exempting GE from liability for nuclear “accidents.” That idea is probably not going to go very far now. Jeffrey Immelt, the chairman and CEO of GE and a big friend of Obama’s (he was named to an unpaid post as “jobs czar” by the president earlier this year, despite the company’s long record of exporting US jobs to places like China and India), says it’s “too soon” to assess the impact on the company’s nuclear business prospects of the nuclear “accidents” in northern Japan. He’s certainly right about that. At this point only two of the buildings housing the six troubled reactors has blown up, and TEPCO has only lost control of the cooling systems in three of the six, and also, so far, only three have suffered partial meltdowns. Things could get a lot worse if one or more goes into full meltdown, or if one or more of those waste “ponds” blows up. DAVE LINDORFF is a founding editor of ThisCantBeHappening!, the new independent, collectively-owned, journalist-run, reader-supported online alternative newspaper. Is there anyway to force the closure of these facilities? I live in Illinois and I am very, very concerned for my family and myself. I am especially worried that the Mark I type is in Illinois. Is there any hope; any kind of mask that can be worn, and any kind of water purification system that can decrease the risk from contaminated water? Please respond. Thank you. Sorry Denise but a mask that could actually protect you is very expensive and so are the filter cartridges that you would need to constantly replace. The filter will collect radioactive particle and become dangerous so you’ll need to check them with a geiger counter and toss them when they get “hot”. If water purification was cheap and easy there would be no concern about all the contaminated water at Fukushima. You can try to find a copy of “Fighting Radiation & Chemical Pollutants” by Steve Schechter it lists food and vitamins supplements that may help. I’d try amazon.com it may be out of print.